25 March 2014 (with follow-up) – A year into the new Rule of Francis, the Pope has met almost every key Western leader, with one particularly glaring exception. 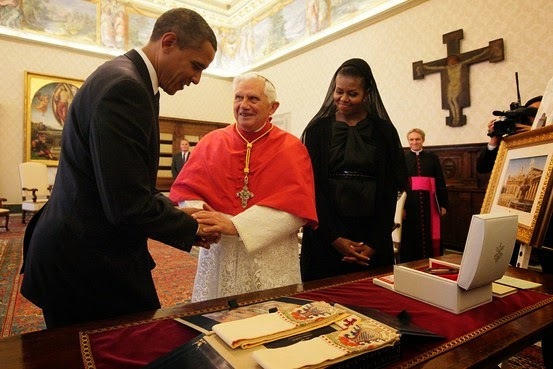 That'll change first thing Thursday morning, as President Obama returns to the Apostolic Palace for his first meeting with Papa Bergoglio and second overall with a Pope after his July 2009 visit to Benedict XVI. 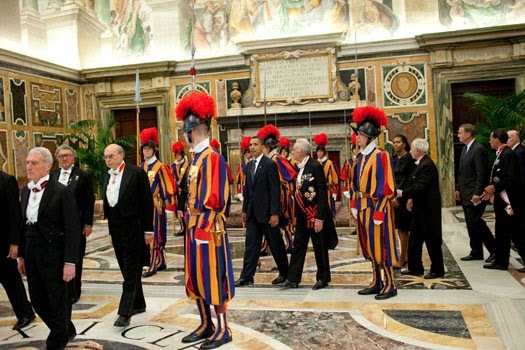 Given its late afternoon scheduling to accommodate Obama's schedule – and the now-retired Pope's desire to meet with him – that earlier visit upended standard Vatican protocol, which invariably sees heads of state and government received from mid-morning until noon. This time, with Francis enjoying Stateside approval numbers more than double those of the battle-weary, second-term president, Air Force One is touching down in Rome tomorrow night to allow for the morning time-slot. A keen morning person, Francis prefers to hold the daily rounds of courtesy audiences for high-profile visitors before lunch. Despite the new reality of the Pope residing at the Domus, almost all of his formal meetings are still held in the Papal Apartment atop the Palace, which he continues to employ as his daytime office. In another change from the last POTUS-Pope summit, the First Lady won't be meeting Francis alongside her husband; together with the couple's two daughters, Michelle Obama is on a visit to China. As the Vatican stop is part of a six-day swing through Europe and Saudi Arabia, the makeup of the delegation accompanying Obama on Thursday remains unclear. Of course, amid the Democrat's prominent support of legal abortion and the seeping of the wider political polarization into American Catholic life, no modern Commander-in-Chief can visit the Pope without a spate of controversy, or the desire for it from media or lobbying circles. A year since Francis' emergence, however, the Obama White House has come to warmly embrace the new Pope, with the president even taking to pulling quotes from the pontiff on the stump. At a preliminary briefing for the visit, White House Press Secretary Jay Carney said that Obama "has long looked forward to meeting Pope Francis. "He has very much admired the leadership he has provided in his first year as Pope, his commitment to address issues like income inequality, and his leadership of the church more broadly," Carney said, adding that the president was especially intent "to hear about the very ambitious agenda that [Francis] has launched in his first year." Following the president's sit-down with the Pope – likely to comprise around a half-hour one on one, then the usual exchange of gifts and Francis' greetings to the traveling aides – per custom, geopolitical issues will come into further focus as Obama meets with the Vatican Secretary of State, Cardinal Pietro Parolin. Next week, another top-flight visit's in store for Francis as Queen Elizabeth II returns to the Vatican to meet with the seventh Pope of her 62-year reign. Given the British monarch's historic role as supreme governor of the Church of England, the encounter brings an added ecumenical dimension, all the more given the queen's intense personal faith and commitment to a prominent place for religion in society. Set to be accompanied by the Duke of Edinburgh, in a sign of the Pope's esteem, the royals won't be received at the Palace, but for a more personal visit at the Domus. Soon to turn 88 and in the process of handing over an increasing amount of duties to her heirs, the queen's Rome swing will be her first overseas trip in three years. Back to Obama's stop, meanwhile, as domestic affairs always tend to frame the stage for an American president at the Vatican, this week brings converging storylines featuring a couple key threads on the US' church-state front. First, underscoring the bishops' prime clash with the administration over recent years, today brings the oral arguments at the Supreme Court in two cases seeking an overturn of the Federal health-care reform's mandate for contraceptive coverage in benefit plans. As opposed to the scores of suits filed by church-related entities nationwide over the Obamacare mandate's exemptions for religious employers, however, the cases at issue today involve the ability of for-profit businesses to opt out from covering contraceptives on religious freedom grounds. With the church suits encountering a clash of outcomes as they wend their way through lower courts, Supreme Court review for those cases is likely in the next term. As the mandate took force for non-exempt religious institutions last January, several injunctions were issued to Catholic entities, allowing them to not comply without penalty until the cases were settled. Most prominently, the SCOTUS granted a stay for the Little Sisters of the Poor and other church organs enrolled in its Christian Brothers-administered plans. While the issue of the mandate was raised as a concern of the Holy See during Secretary of State John Kerry's January meeting with Parolin, for his own part, Francis has indicated his preference that matters of domestic issue engagement are optimally addressed by the relevant conference of bishops. That signal began at home – within weeks of his election, the Pope told the Italian bishops that their national body would lead the response to the country's political affairs, ending a longtime tug of war over that role between the Vatican and the CEI, as the conference is known. And lastly, even if this week has Obama in Rome, in an unusual twist, the center-stage element of the president's visit is the Pope's return of the favor. As has been understood among church officials on both sides of the Atlantic for several months, what's likely to be Francis' lone US tour – not to mention Jorge Bergoglio's first-ever trip to these shores – is widely expected to take place at the end of September 2015. While the date has been locked in for over a year following B16's June 2012 announcement that Philadelphia would host the Holy See's eighth World Meeting of Families at that time, the change of pontificates has altered the shape and focus of the last commitment Papa Ratzinger wrote into his calendar, and the response to the new Pope has inspired hopes for the most extensive papal journey to the States since John Paul's epic two-week, seven-city swing in 1987. Yet only this week is the requisite protocol machine rolling into motion. For any PopeTrip to happen, as a head of state, the pontiff must be invited by his civil counterpart in the country in question, as well as the national church via its episcopal conference. Accordingly, Obama will ostensibly follow the precedent set by George W. Bush in inviting Francis for just the second papal state visit to the US. And even before the president touches down, a high-powered delegation of Philadelphia officials led by Archbishop Charles Chaput OFM Cap. alongside Pennsylvania Gov. Tom Corbett and the city's Mayor Michael Nutter are spending this week in Rome to discuss planning for the families' event (below) before a brief private meeting with the Pope prior to tomorrow's general audience. In addition, it is no accident – and, again, fully in keeping with tradition for papal scheduling – that the Vatican slated the Family gathering to coincide with the peak period of the UN General Assembly in New York, an address to which was a core element of John Paul's visits in 1979 and 1995 and Paul VI's historic 13-hour trek to Gotham on St Francis' Day 1965. As only the Holy See can publicly confirm the Pope's travel – and, in this instance, isn't expected to do so for some time yet – officials have been forced to tiptoe the fine line of anticipating Francis' attendance without conveying it as definite. 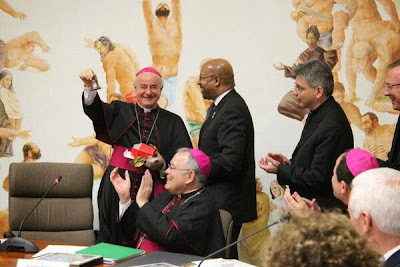 Speaking of the Families' Meeting at a late-morning Vatican press conference today, the president of the Pontifical Council for the Family, Archbishop Vincenzo Paglia, illustrated the exercise with his statement that even as "the Philadelphia Meeting is looking first of all to gathering the churches of the Americas... there is no doubt that the presence on the Chair of Peter of the first Latin American Pope makes the event even more meaningful." The longtime chaplain to the Sant'Egidio movement, Paglia playfully ducked a subsequent question seeking a timetable on Francis' confirmation of the visit plans. Out of deference to the local media who've swarmed Rome to cover the trip, today's briefing was a rarity for the Press Office, being conducted almost entirely in English as opposed to Italian. For purposes of context, it bears noting that senior US prelates first received word of B16's April 2008 visit to New York and Washington all of seven months in advance, and the trip was publicly confirmed two months later. While Benedict delighted the Secret Service-led security team with his preference for smaller venues for the twin public Masses and his understanding of the needed "bubble," planning for Francis – who famously reveled in having his car swarmed in Rio and once mused that "a bishop behind bulletproof glass is crazy" – is bound to make for a rockier negotiation between the Pope's premium on closeness to the crowds and the paranoia of those charged with his protection. Initially slated to be revealed today, the theme of the 2015 gathering still awaits Francis' signoff. 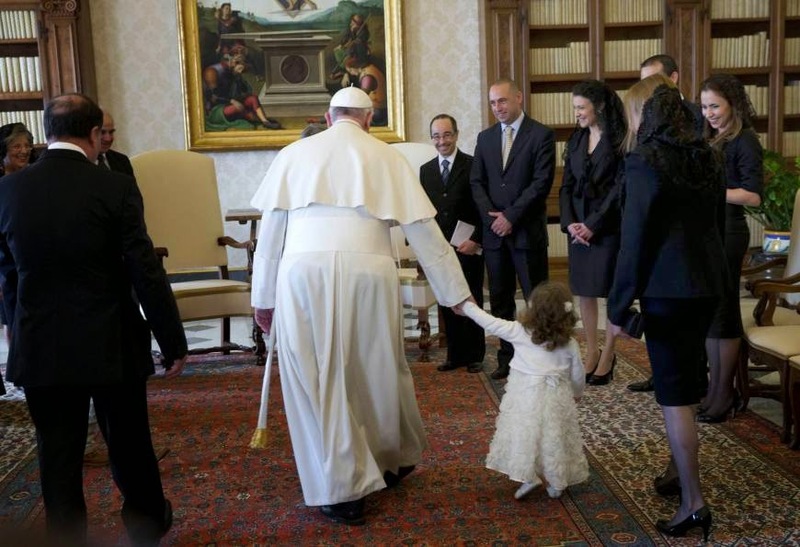 Regardless, next year's Meeting plays squarely into the issue the Pope has designated as his ecclesial centerpiece for the next two years – the role and challenges facing the family in the life of the church. Amid ongoing skirmishes between senior prelates over possible evolutions of pastoral practice in addressing difficult situations, this October's Extraordinary Synod and an ordinary assembly in October 2015 are intended to discern new ways of proceeding. Speaking of Francis' road calendar, after months of rumors, only earlier this month did the Vatican confirm a mid-August PopeTrip to South Korea for a pan-Asian youth gathering. Aiming to clear out his long-haul travel before anything else, Papa Bergoglio is likewise expected to visit Africa in either late 2014 or early next year. After July's triumphant homecoming in Rio for the already-planned World Youth Day, the Pope has repeatedly said that his next return to South America won't come until 2016 at the earliest.